This is the time of year when we get sucked into a frantic kind of busyness imposed on us by the swirl of holiday fervor leading up to (and hopefully ending in) Christmas. It starts with the build up to Halloween giving us three months of socially fueled mania. And many wonder why we dread the holidays. You might be interesting in reading more about The ‘Busy’ Trap here. Watching my schedule fill up, I thought I’d circumvent some of the stress by eliminating items from my schedule starting with the coloring page. You know, one less thing. It’s not that I didn’t want to do a coloring page, it’s simply that creating one takes nearly two full days to design, then color, then set it up on my blog. I was single-mindedly clearing commissions from my docket non-stop and I needed a break. Is it just me who needs a regular shift of activities? It’s not that I don’t like to work constantly. I rather enjoy my work. But I get bored easily. And do you know what’s great about doodling? It’s just as relaxing as coloring. I drew upon mandalas and henna designs for my inspiration. I hadn’t intended it to be a coloring page, but she emerged from the page nonetheless. And I was content. I hope you will be too. 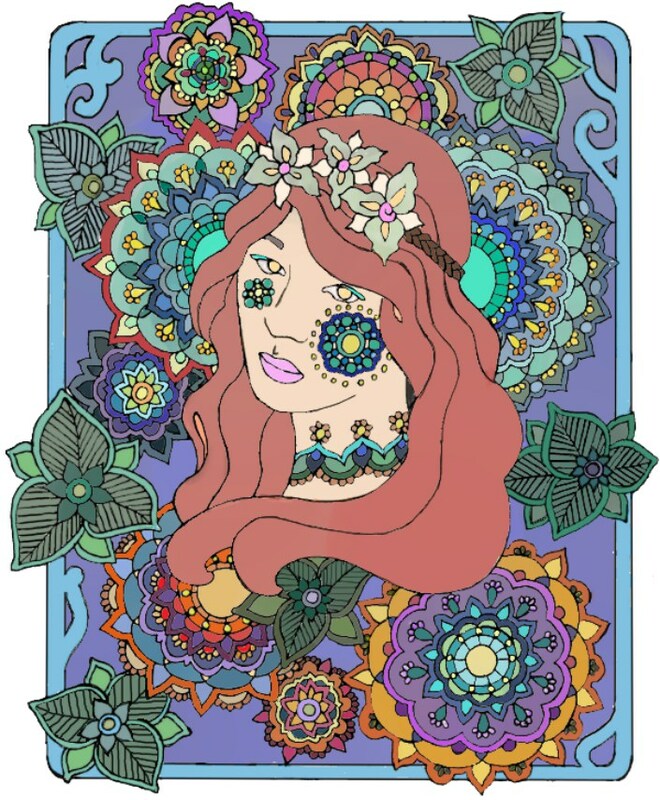 I create my coloring pages for my subscribers absolutely free. If you’re already a member and know the password, head over to the library.